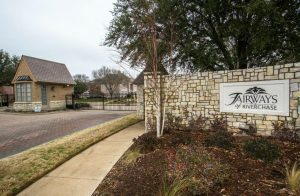 Fairways At Riverchase is a gated golf course community located 10 minutes away from DFW Airport in the north eastern portion of Coppell in the 75019 zip code. The community has easy access to Highway 121 and the George Bush Tollway. The 98 homes in this community range from 300k to 600k and were built between 1994 and 2001. The Fairways at River Chase is the only gated community in Coppell and has approximately 30% of its homes sitting on the golf course. The golf course is and 18 hole golf course with 14 of the wholes having water in play. The course is approximately 6593 yards of Champion Bermuda greens. The city Coppell has easy access to 635, Highway 121 and the George Bush Tollway. Several large companies call Coppell its home. Some of the companies are CiCi’s Pizza headquarters, IBM, Amazon, Verizon, Lucent, Mohawk Industries, Container Store, Staples and Samsung. Coppell is not serviced by the DART rail.